As a boy, our dinner table was a place of amazing conversations. My father readily invited people to dine with us, and my mother as readily accommodated them. On top of that, we had a stream of visitors from all over the world, people who knew and respected my father. Many were missionaries, others were world travelers; one was a part of a film crew that went to Loristan and had exciting tales to report; another was a French doctor from Central Africa, and so on and on. I remember vividly the exotic tales they had to report. This was an important part of my education. I recall one man whose World War I saga included the war, imprisonment, and wanderings over two continents. At times, he lost track of the days of the week, the months, and then even the exact year. Meaning, he said, was tied to time and the calendar. The calendar listed Sundays, holy days, and more. It punctuated time with meaning, an imposed meaning which was more than ourselves. Think about that. We live in a world with a given meaning, given by God and by man’s long pilgrimage of faith. Remove that, and we drift into meaninglessness. But the Bible is not a devotional manual: it is a battle plan and a prescriptive word, a command word, and therefore a law word. The “spiritual” preachers deserve not even a yawn: they are putting the church into the sleep of death. God’s servants will declare, “Thus saith the Lord”, and His word covers every aspect of our lives, our work, our family life, our sexuality, politics, economics, farming, business, social and personal lives and all things else. ~ R.J. Rushdoony – IBL, Vol. 2, Law and Society – Let His enemies tremble, pg 689. The Son comes as the great high priest, to make atonement to God and to remove sin. He comes as the great prophet, to speak God’s authoritative word and final word of revelation. He comes as the king, to rule the new humanity and the new creation. In Christ, we are citizens and members of God’s new and eternal world. If we can set aside the six-day creation doctrine, we have asserted our supremacy over Scripture. Our mind and our convenience now have a higher authority than the Bible, so that we have denied its authority totally and asserted our authority instead. If we claim the right at any point to set aside Scripture, we have established ourselves as the higher authority at every point. Clearly, therefore, the question of authority is at stake in Genesis 1: God or man? Whose word is authoritative and final? Rushdoony argues that some people who claim to believe the Bible from cover to cover actually mean they believe in their favorite verses of the Bible. They interpret God and His Christ in light of their favorite bible passages (“God is love,” comes to mind). Thus, they make themselves the principle of interpretation. 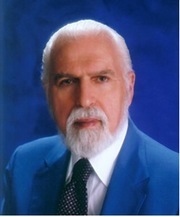 R.J. Rushdoony, Lectures on John.